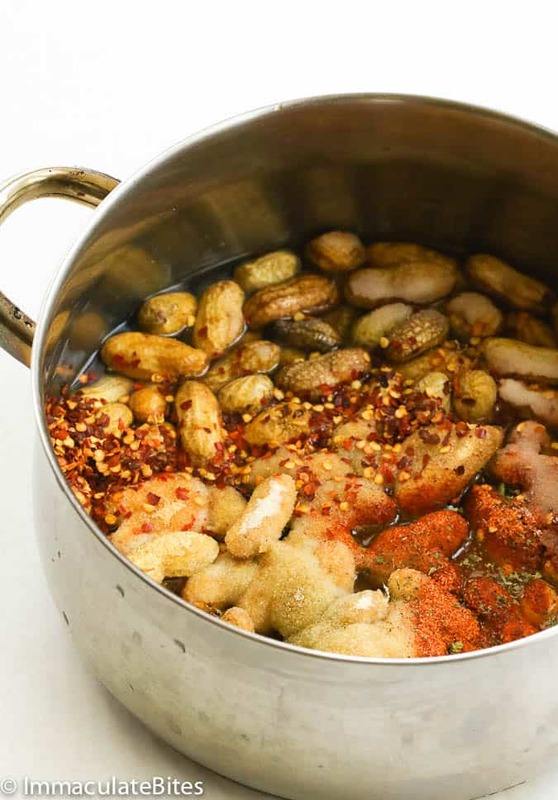 Spicy Cajun Boiled Peanuts — are salty, spicy, nutty and oh so addictive. Perfect for summer snack time, late night movie marathon and for entertaining. A classic Southern delicacy! Please, humor me, while I tell you more about this Additive Snack and how it’s cooked in both Africa and in the South. 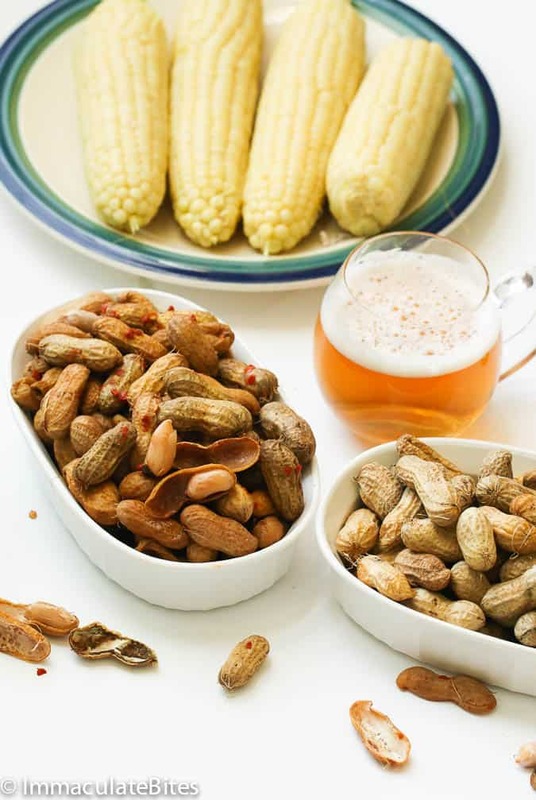 Boiled peanuts have a rich history. Yes, huge in the Southern part of the United States. 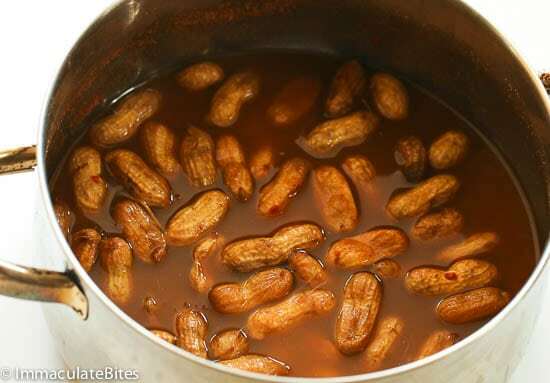 If you drive through the southern US in late Summer you’ll see roadside stands, “Boiled Peanuts”. I did a little digging and this is what I uncovered. 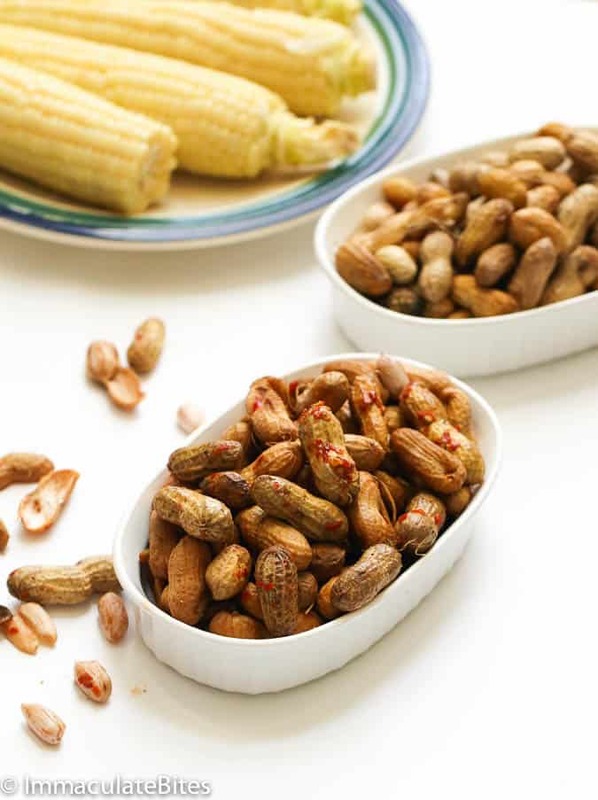 It all started back during the Civil War when Southerners started boiling peanuts on their march through Georgia. Food and supplies became hard to come by after the confederate troops split up. So they found a way to combat hunger by roasting peanuts over campfires and boiling them. And you probably know what happens next. Someone decided to add salt to the peanuts to prolong it’s shelf life; thus the birth of hot salted boiled peanuts in the U.S. The peanut fever then spread in the Southern part of America in the 18th century. And the rest is history! While we are on this topic I have got a trivia for you. Did you know that in 2006, the state legislature declared peanuts as South Carolina’s Official Snack Food with unanimous vote? That’s how beloved this snack is in the south. Now lets switch to the other side of the continent – shall we? Groundnuts have long been eaten for centuries, in most West and East African countries . Yes it’s known as groundnuts in Africa, and to my surprise it didn’t originate in Africa. 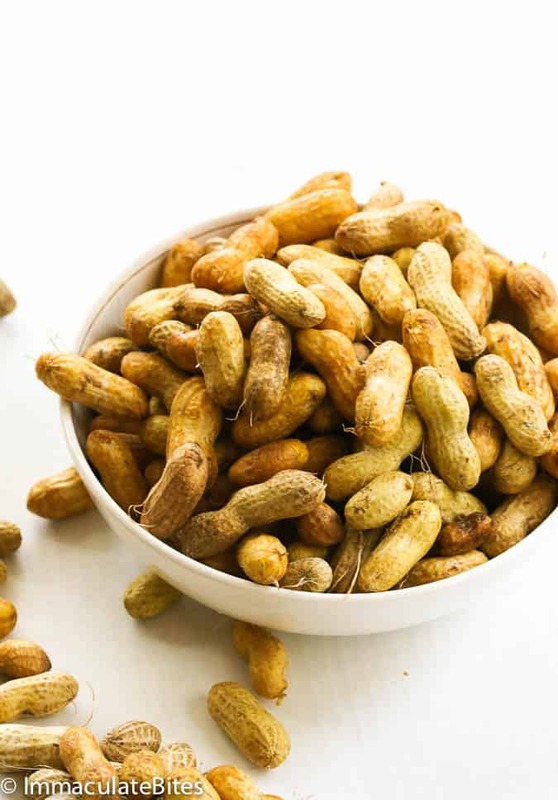 Historians say, the peanut plant originated from South America and the Portuguese took it to Africa, sometime in 1500 after they had it in Brazil. The love of peanuts quickly spread across Africa and became a popular staple in dishes like African Peanut Stew aka Groundnut Soup. You should give a try sometime , if haven’t already. There’s a huge difference between the way some Africans ( I know, I shouldn’t generalize …. ) enjoy boiled peanuts . It’s typically cooked for about 3 minutes or more to retain a little bit of crunch, and for optimal flavor. There’s a real appeal to it ! And it’s always my first choice of boiling Fresh peanuts. 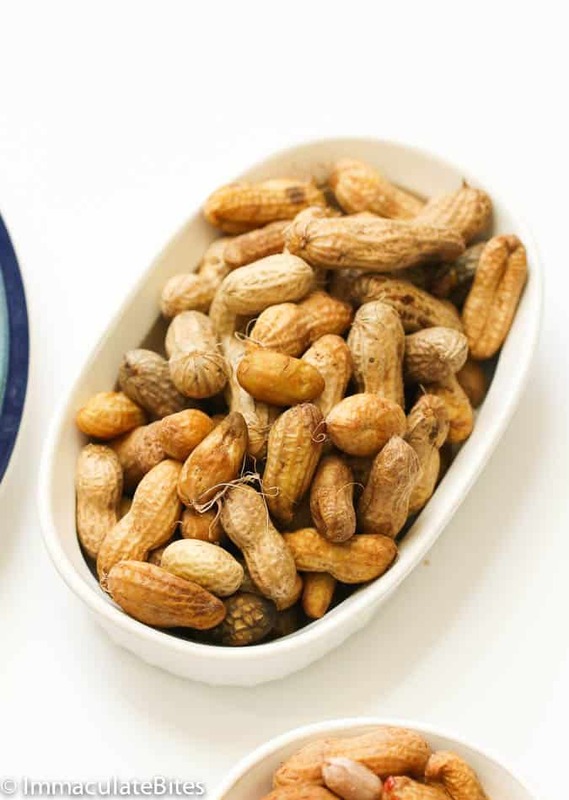 Southerners on the other hand, prefer the hot, mushy, soft boiled peanuts, boiled in salty water/ with or without added seasonings , for several hours -depending on the peanuts. Fresh green peanuts, which are the best ones to boil, would be ready in less than 2 hours ,while those that are out of season older raw peanuts, might take more than that. 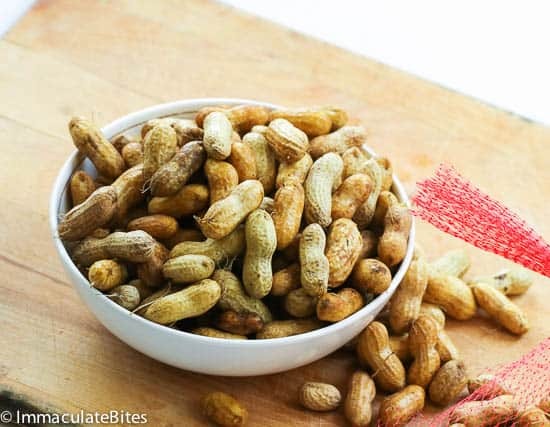 You can find raw or green peanuts that are straight off the vine in farmer’s market in your area and most grocery stores’ produce section, right around this time (late summer) , throughout the southern region . Anywhere else your best bet would be farmers market and some Asian markets. I get mine from the farmers market (check out Asian Farmers). 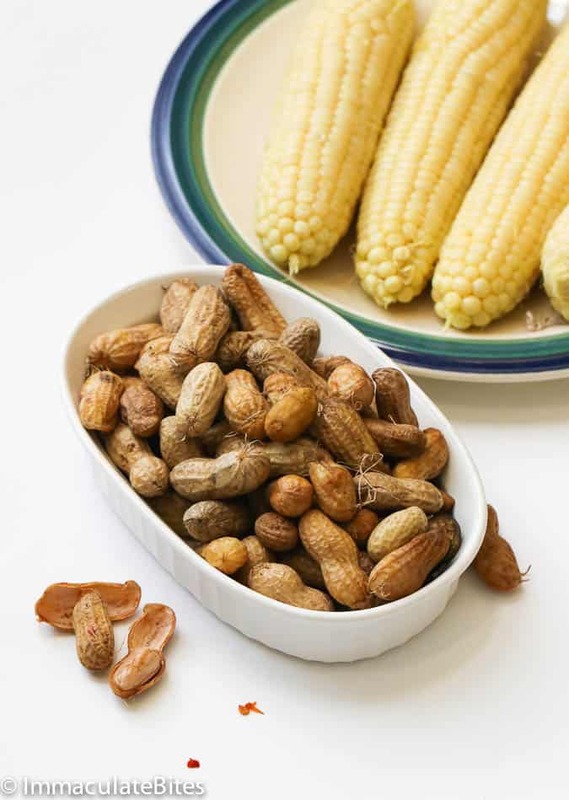 And for that more satisfying experience, I’d suggest you pair up your boiled peanuts with boiled corn on cobs which are both in season. 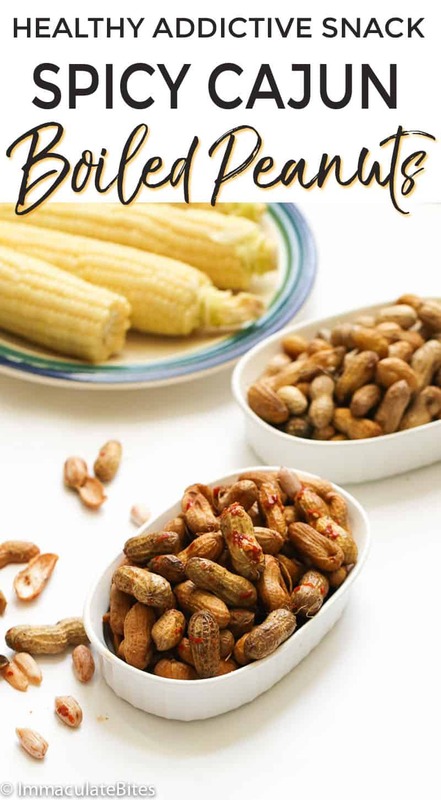 Nothing can beat a good old healthy boiled peanuts and corn. Enjoy! Fresh green peanuts in shells, not the roasted or cooked ones, are the best type to boil. Ready made boiled peanuts are also available in cans at local chain grocery markets. But I prefer to buy those hot boiled peanuts on the roadside stands, gas stations or on large outdoor events cause I feel like I’m helping them out by buying from them instead from bigger food companies. 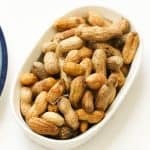 In boiling older raw peanuts, you’ll definitely need to use a lot of salt as you need to refill the boiling water continuously to achieve your desired softness. To check if you’ve reached the desired softness, take a sample out of the pot to taste them. You may adjust the seasonings to your preference especially if you want it less spicy and salty. 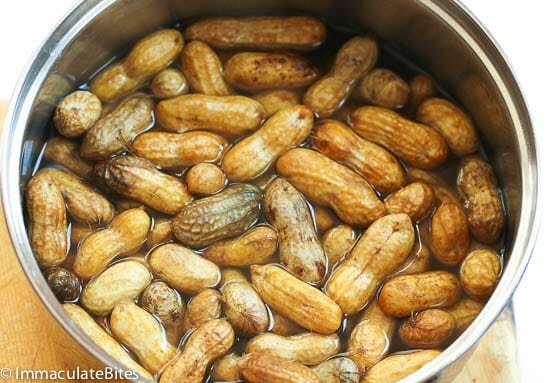 Boiled peanuts can be stored in the fridge in a freezer containers for only 2-3 days. 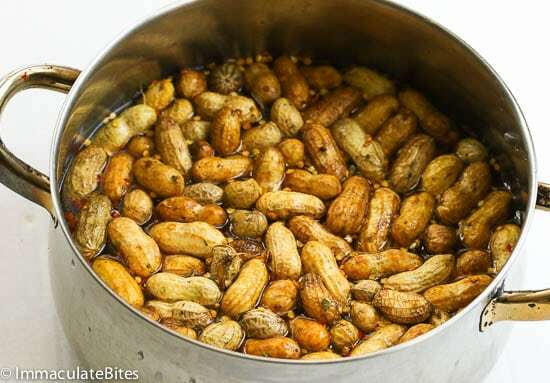 To store them, allow your boiled peanuts to cool down before transferring the liquid and the peanuts in a covered container. Refrigerate them for 2-3 days. When serving up, extract those peanuts into a bowl with its liquid. Leave them soaked in its liquid to retain the salty, spicy flavor and heat level while snacking on it. Make sure to have napkins on hand while munching on them as it often drip spicy juice when you split open the shells. 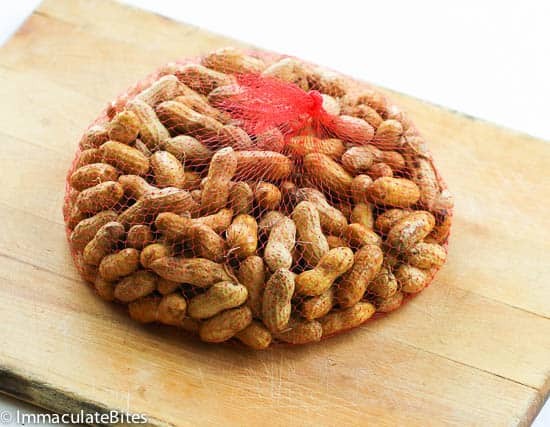 There should be enough liquid to cover the peanuts at all times to prevent it from being salty. Add as you go. 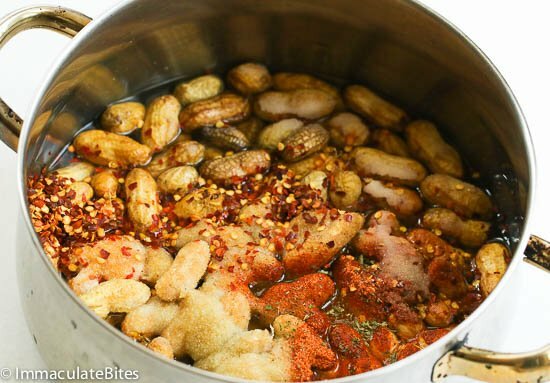 Spicy Cajun Boiled Peanuts -- are salty, spicy, nutty and oh so addictive. Perfect for summer snack time, late night movie marathon and for entertaining. A classic Southern delicacy! Wash the peanuts, then place in Large pot .Add water , salt , onion and garlic powder, creole seasoning, and pepper flakes . Do a taste test towards the end of cooking - adjust salt , with more or less water to suit your tastebuds. If cooking African Style cook for about 3 minutes or more - with boil water and salt. I dont know about who wrote the blog. But I spent years working in Nawleans and I have had many ways. My favorite is not only the spices mentioned but I use a little liquid crab boil in most supermarkets and I put in fresh heads of garlic, onion and your favorite fresh pepper. Jalapeno, serrano, or habanero. Peel garlic but leave whole cloves. Onion into thick slices, and peppers I halve. Take seeds or leave. Depends how much heat you like. The garlic is then like an extra treat to munch. Thanks for taking time out to share this tip with us. Greatly appreciated. As a southern boy my grandfather instilled in me one thing. When you go fishing you bring poles ,bait ,beer ,and boiled peanuts. that’s the key to a good day. I hear ya! Peanuts is one one of the best snacks for me. 🙂 Thanks for stopping by, Kevin! Yes, they sure can. Cook for about 60 minutes or more depending on how you like your peanuts . Emma dear, I rate your website a 10+. Every recipe I have tried is a winner. 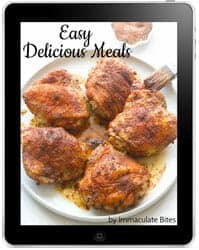 Your recipes are so lucid and easy to follow and one can sense the passionate zeal you have. Can the peanuts be cooked in a pressure cooker to save on time? Thanks again for making cooking such a pleasure. I think I first had them in North Carolina from a roadside market and addictive is right! Never thought of having them with maize but I think you’re also right that it would be an excellent compliment to them. Can’t wait to try it; thanks! Oh and thanks for the history lesson about them too! Hey Dunori! Glad you enjoy the history Lesson! Do let me know it works out for you . Thanks ! My mind is blown by this recipe. Can’t wait to try it.